Fall season registration is available for all ages. The Lady Cyclones will have teams at the 6U, 8U, 10U, 12U, 14U, 16U and 19U levels. Players who are or will be between 5 and 19 years old during current calendar year are eligible for registration. Practices begin after Labor Day and the Season begins in mid to late October and runs through the end of February. Jerseys are included in the ice fees for 6U/8U teams. For all other teams, players must have an official set of Lady Cyclones Jerseys. If you do not already have them you will be required to purchase them. In addition to ice fees, teams may elect to participate in jamborees or tournaments. This may be at an additional cost. Independent evaluators will be present and evaluating each player in several skill categories to best determine level of play. All players should bring a light and dark jersey for evaluations. You will be assigned a group light or dark when you arrive. Please try to avoid colors are hard to fit into one category like red, yellow and pink. This would be a great time to get your skates sharpened (ideally before pre-skates). Also you should check the rest of your gear to make sure everything is in working order. Specifically check the fit on helmets and make sure your screws are tight and not missing. Pre-skates and Evaluations will be held at Brentwood Ice Arena and St. Louis Ice Zone. * Any extra fees such as, but not limited to USA Hockey membership, Team fees, Travel expenses, Club game jerseys & socks, etc. are considered extra fees and are not included as part of your ice fees. Payment plans for the ice fees are available during the registration process. The payment plan breaks your ice fees down into a $50 down payment and four additional installments due on 8/15, 9/15, 10/15 and 11/15. If you have circumstances that require special consideration please reach out to Chris Johnson chrisj@stlladycyclones.com before registering. 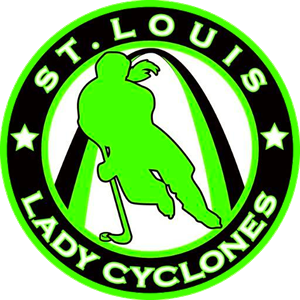 If you have more than one daughter playing on a Lady Cyclones team please text Chris Johnson at 469-203-9702 or e-mail him at chrisj@stlladycyclones.com (before registering), regarding our Sibling Discount program. The first player is full price, the second is 30% off and a third player is 50% off.